Baptism is commanded by Jesus in Matthew 28:19; Mark 16:16 and was commanded in Acts 2:38-41 so that about 3,000 were baptized on Pentecost. Those who do not understand the Scriptures nor the power of God, will say salvation is by “faith alone” and that “faith only” is necessary. They will refuse to baptize as the Apostles did on Pentecost. Why? 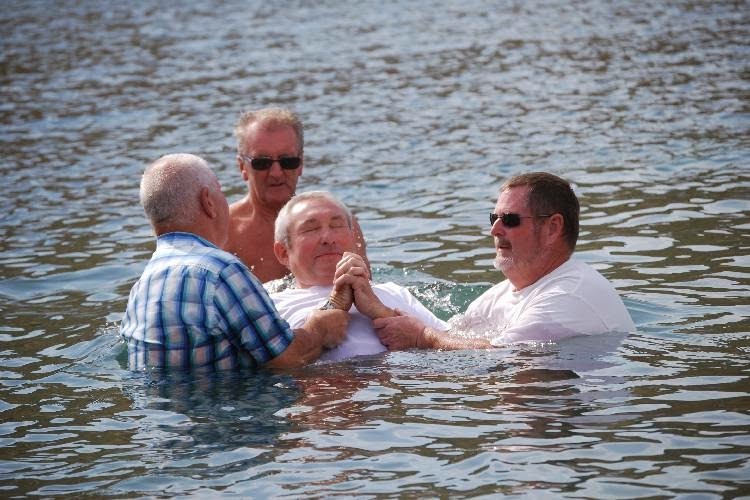 Becasue they can’t comprehend the power of God for salvation being exerted at the moment a person of faith – faith is integral – goes down into the water. Now when these reject baptism because, they say, salvation is by “faith alone”, then won’t admit that this exclusion of theirs excludes also confession, repentance, and even a “sinner’s prayer”. Jesus taught the Sadducees that “God is the God of the living”. Jesus quotes Exodus 3:6, which said, “I AM THE GOD OF ABRAHAM, AND THE GOD OF ISAAC, AND THE GOD OF JACOB’? The verb is present tense, “I am”; not “was”, and thus the soul lives on. The truth hinged on the tense of a verb. The Sadducees denied not only the bodily resurrection, but also that the soul continued beyond death. Luke records in Acts 23:8 that the Sadducees denied that the spirit or angels exist. Jesus responded to the Sadducees’ hypothetical case of a woman who married 7 brothers, according to the law (Dt 25:5), who then died. They asked “whose wife of the 7 will she be”. Jesus said to them, “You are mistaken, not understanding the Scriptures nor the power of God.” Mt 22:39 Someone said the Sadducees, though religious, stumbled over the supernatural as many do today. In the final analysis, the Sadducees had a problem of faith. They couldn’t understand all of the complexities of life after death, and so they denied it all. Jesus said to them, “You are mistaken, not understanding the Scriptures nor the power of God.” Mt 22:39. We too may stumble over the supernatural. Though we can’t comprehend how God answers prayers; how He works His perfect will making “all things work together for good” (Romans 8) while allowing each soul free will and personal responsibility; how the Spirit intercedes with groanings too deep for words; or how there can be only One God but three persons in the Godhead; as well as many other things; but we believe it all to our very core. We must be careful that we don’t allow our intellect to get in the way of accepting the Scriptures – even to the tenses of a verb – and the Power of God. We believe in the Almighty God who still works in our lives. Though it’s apparent that the “miraculous age” has passed, and now remain “faith, hope, and love”, still we must acknowledge God is active in this world and He is working our lives. We must believe that the Father, the Son, and the Holy Spirit are doing and not on a long vacation. We should pray and expect God’s answer because we believe in the God who is surrounded by glory in heaven. We believe in a God who has angels who work for us in the supernatural realm, Heb 1:14. And we believe that you must be baptized, which is the adult immersion in water of a person who is repenting of his or her sins. When a believing sinner comes to the watery grave of baptism, with a heart full of faith in the loving God to save him, that sinner is about to be a new creature. His conscience will be purified. His debt will be forgiven. That old man of sin will be dead and buried, and a new man will proceed forward. Amen, We respect the power of God! We have faith in God! We believe the Scriptures and acknowledge the power of God!